The Millstream River flows through the southern New Brunswick communities of Berwick, Lower Millstream and Apohaqui, and is a tributary of the Kennebecasis River. 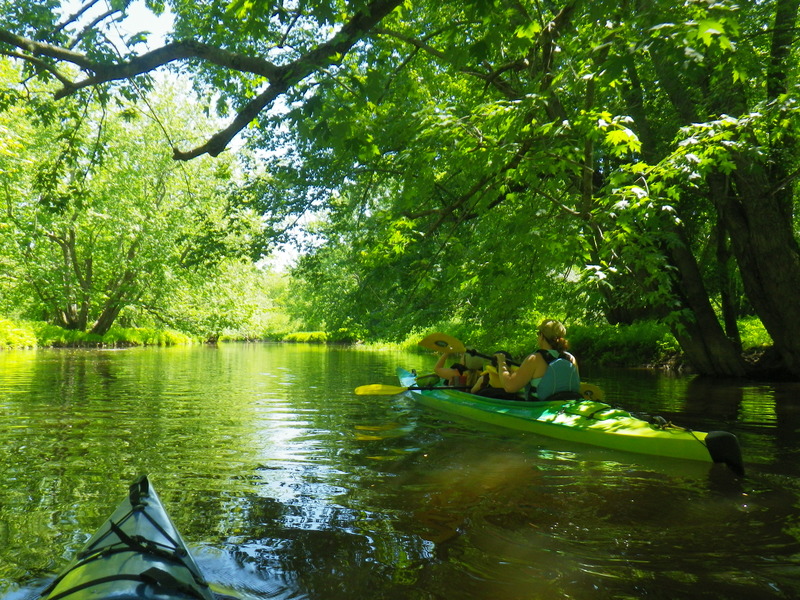 The Millstream River is classic rural New Brunswick, passing through farm fields and cow pastures and old maple trees that line its banks. Try putting in at the Jones Memorial Park in Apohaqui. The river can flow steadily during spring, but it is possible to paddle upstream and enjoy the return trip. Watch for a few sweepers along the way, you need to keep your eyes forward in the turns. Its nearing summer and the end of school for this year. Time has flown by so far, we all can't believe the hot weather is already here. 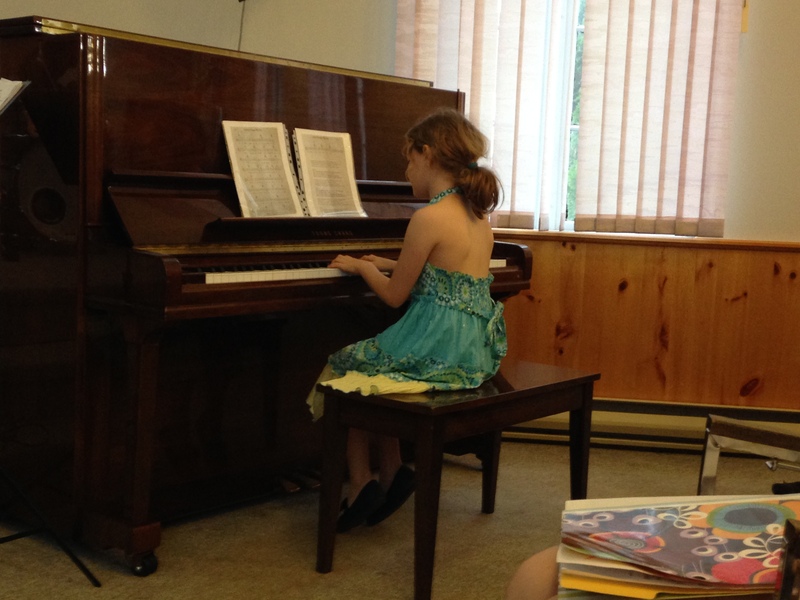 With the end of the semester, the piano lessons come to a close with Rebecca's recital. This year, she played 'Sweet Forget Me Not'. It's an Irish song, which we first heard from Newfoundland's Great Big Sea before the girls were born. Now its a special song for us as Abby and Rebecca have requested it sung for a bedtime lullaby for several years now. Rebecca did very well with her recital in front of everyone. 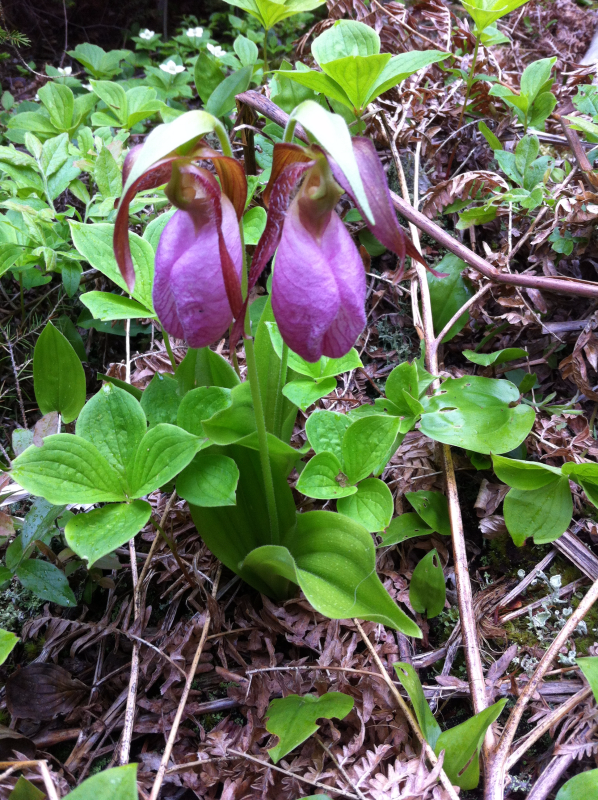 With summer also comes blooming flowers here on our hill. 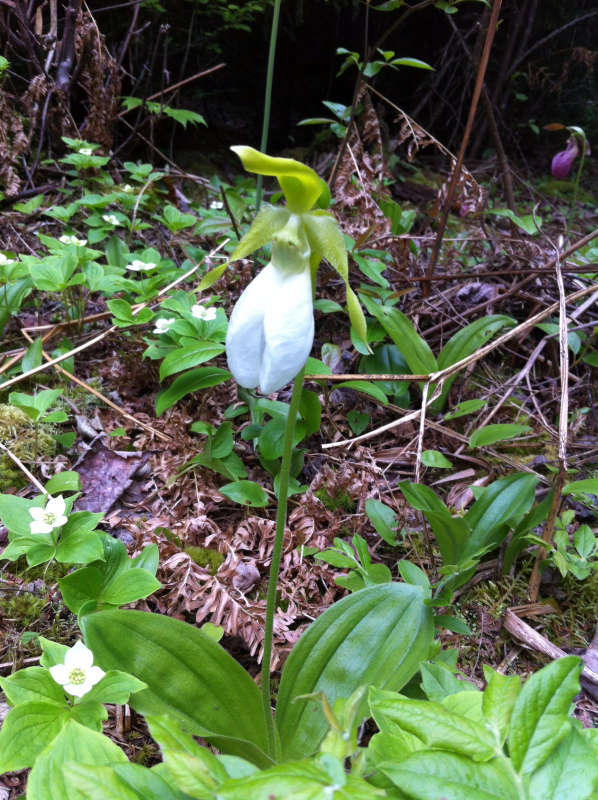 While clearing the trails and paths around our house and land, I found a neat spot with a patch of Lady's Slipper orchids growing in a small clearing. 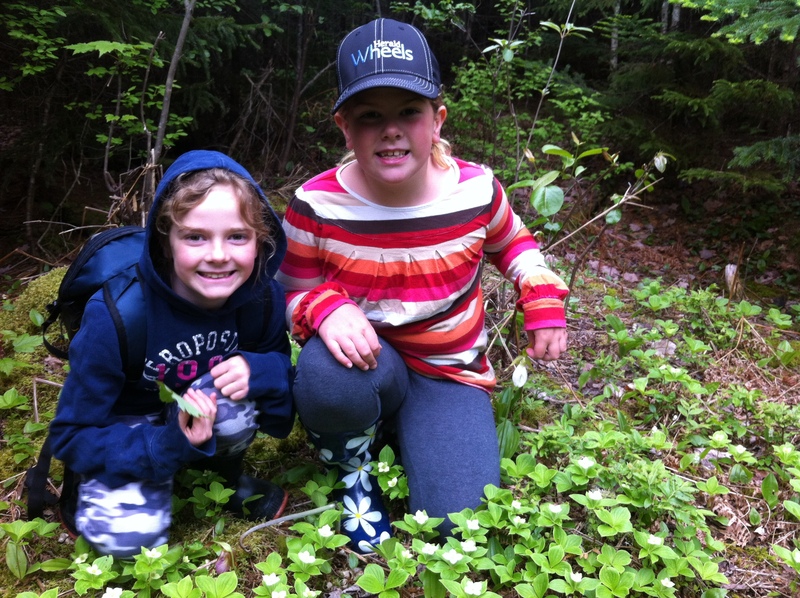 I took the girls to see them and spoke about how rare they are to find in the woods, let alone in a grouping. While we have had rain what seems a couple of weeks, yesterday, we finally had some warm sunny weather. 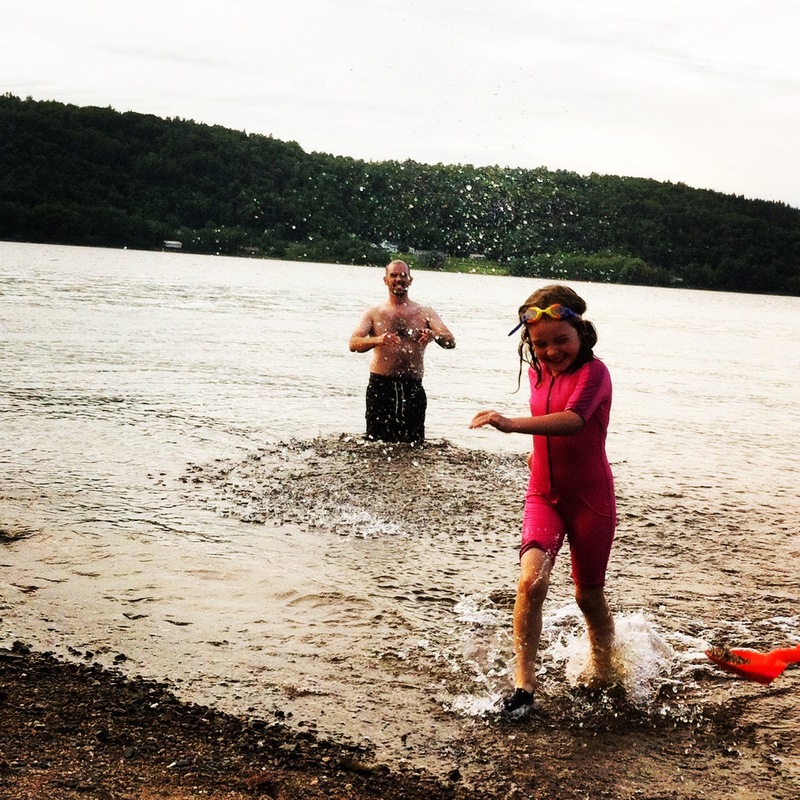 We took the girls out to the Kennebecasis River in Hampton. Launching at the Rivercentre is a great spot to put in, but also a fun swimming spot for the girls afterward. 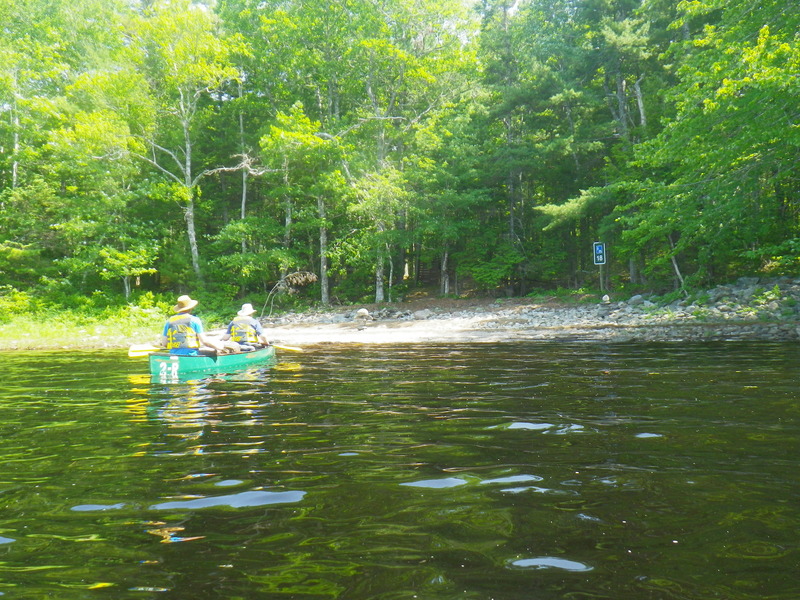 We headed down Beamer's Creek which connects with the Kennebecasis just west of the launching spot. There are always many types of birds to see. We started with a view of an eagle's nest, going well with the feather Abby found before we launched. Beamer's Creek is a nice relaxing paddle. Sheltered from the wind, the creek flows through marshland and tall elderly Maple trees which stretch over the creek throughout. 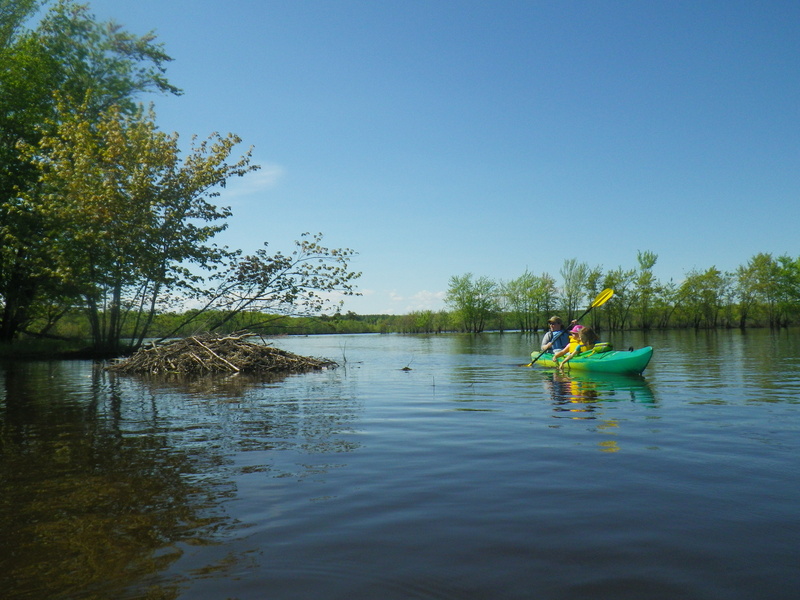 We usually turn around near the large marsh behind Darlings Island, but it can be turned into a loop if you continue along the creek back toward the Kennebecasis. This year, we diverted from the usual backpacking adventure for our yearly trip and tried out our sealegs in a canoe and kayak while camping throughout Kejimkujik National Park, located in Southwest Nova Scotia. 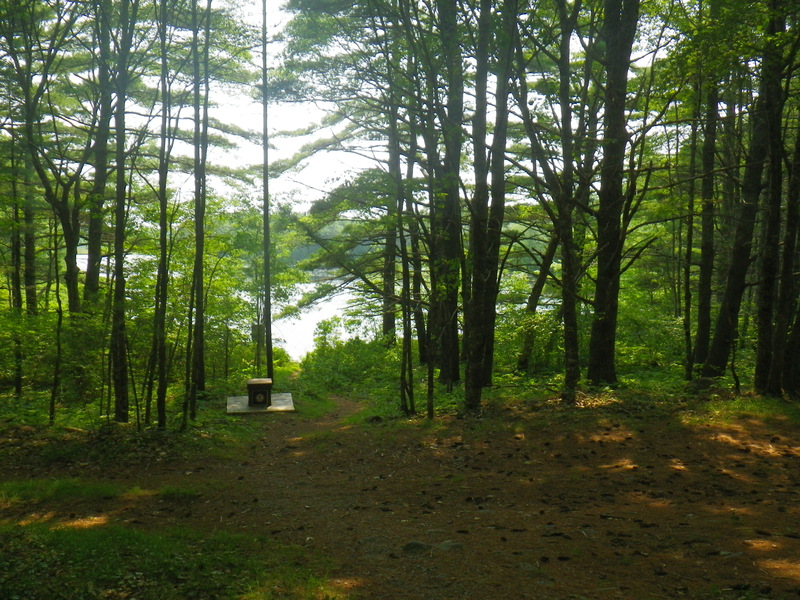 Kejimkujik or "Keji" is a park filled with plenty of lakes, marshland, hiking trails and varying types of forest. 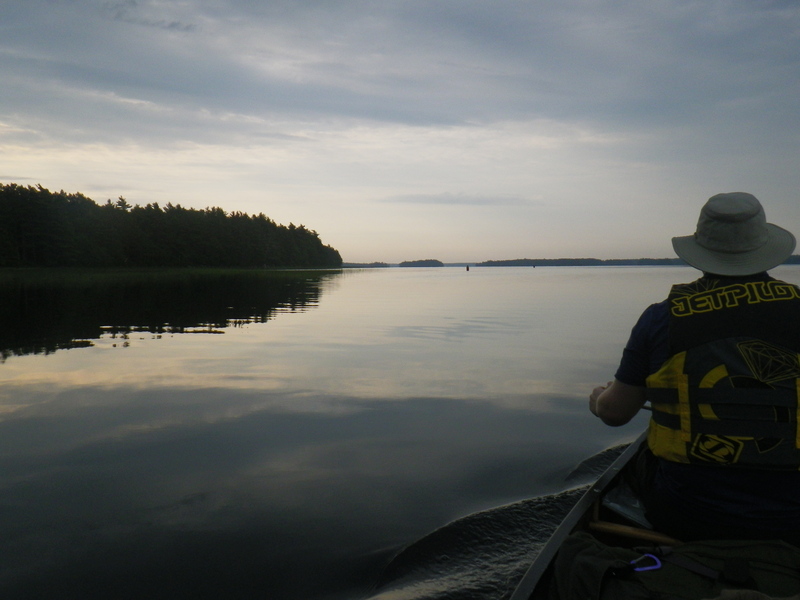 While we had previously hiked in Keji, going a few nights on the water was a new experience for us. 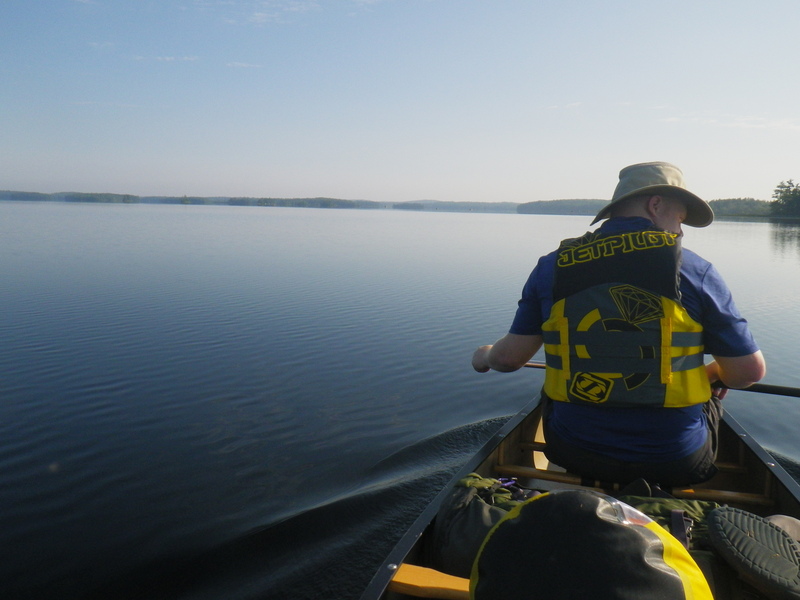 I had been keen on trying a canoe adventure after having watched canoeists in Algonquin Provincial Park during our 2014 adventure. 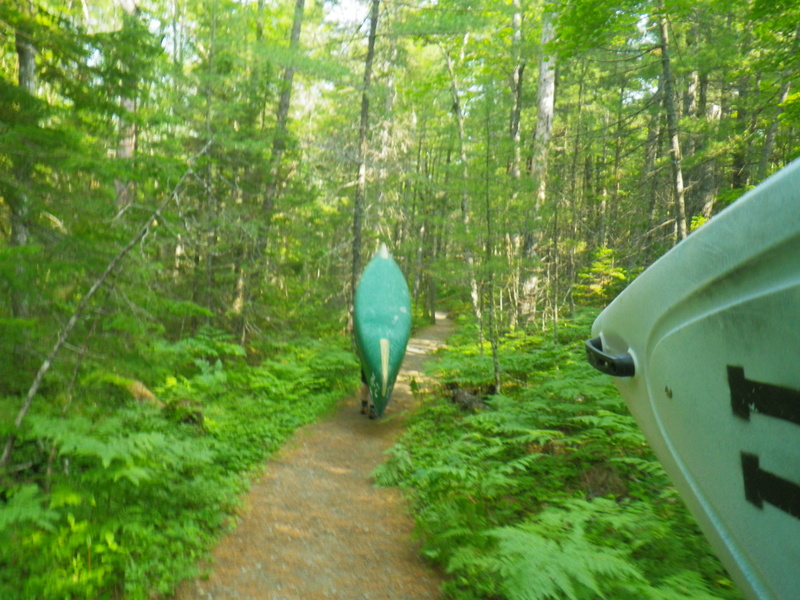 What I would realize is that a canoe really is a workhorse for carrying gear over long distances. Also, when adding the 'portage' element to your travels, it makes for a significant challenge carrying your gear over distances between the water. 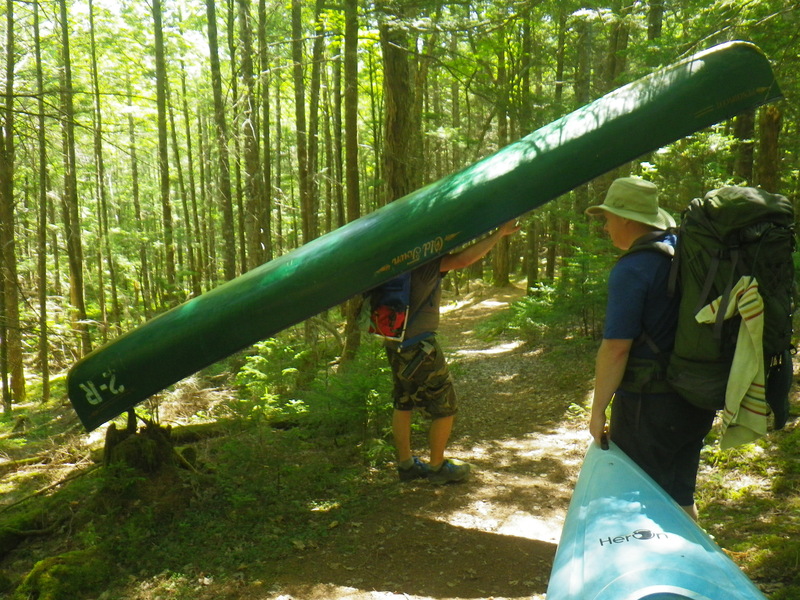 Despite the challenge, completing a difficult portage was rewarding and actually used different types of exercise, making for a good change after paddling. 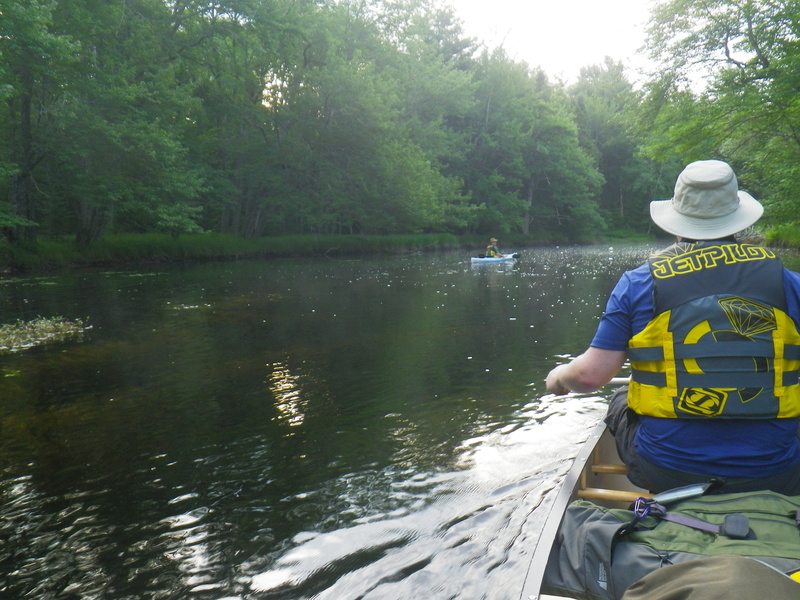 As we were taking on a canoe trip this time it also presented us with a few new routines with packing, changing clothing, waterproofing, and carrying our watercraft. 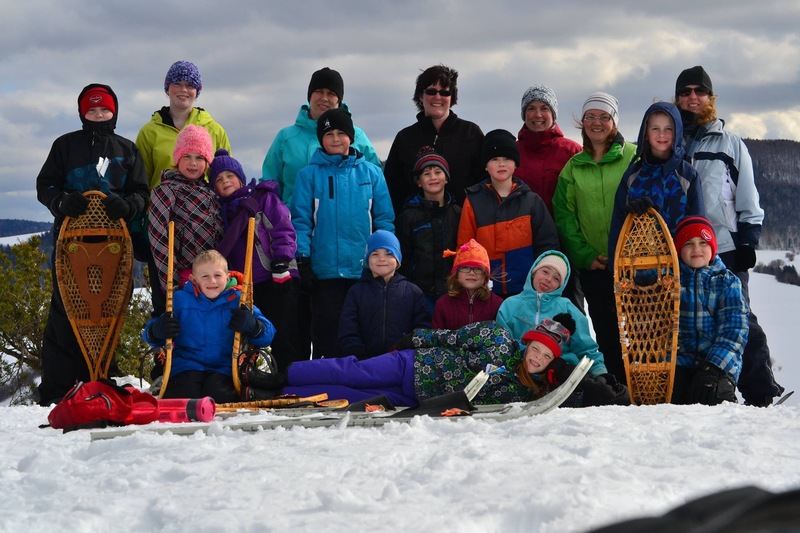 Portage Q to Big Dam Lake to Portage R to Still Brook to Portage S to Frozen Ocean Lake to Portage T to Portage U to Channel Lake to Portage V to Little River to Campsite. Minard Bay to A to N. Portage E to to Mountain Lake to Portage F to Peskowesk Lake to Portage N to Peskawa Lake to Mason's Cabin. 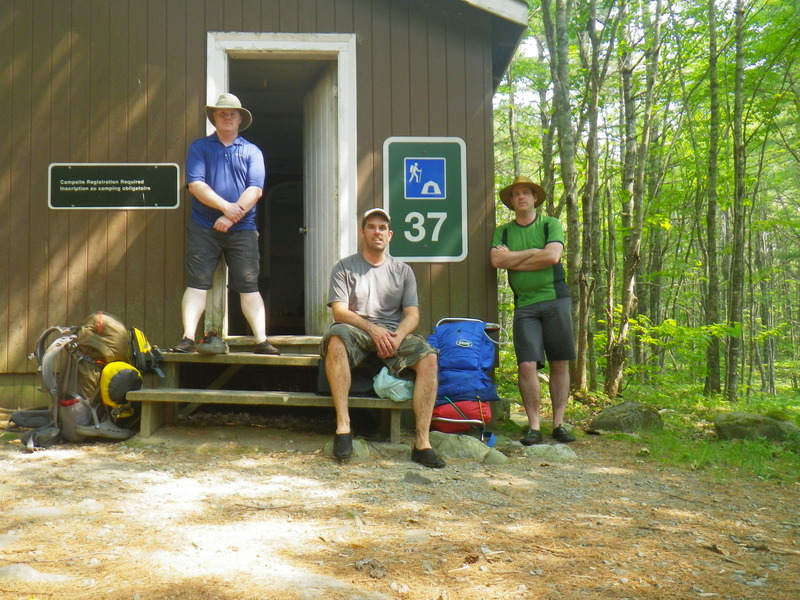 Campsite 37 (Mason's Cabin) to Beaverskin Lake via Portage L. Peskowesk Lake via Portage K. Gabrielle Lake to Portage C to Puzzle Lake to Portage B to Cranberry Lake Portage J to Keji Lake Campsite. A great park map with the portages and distances can be found here: http://www.paulillsley.com/kejimkujik/park.html. Our average distances were between 18 and 22 kilometres. As for our trip, holy portages you say! Yes, there were quite a few. 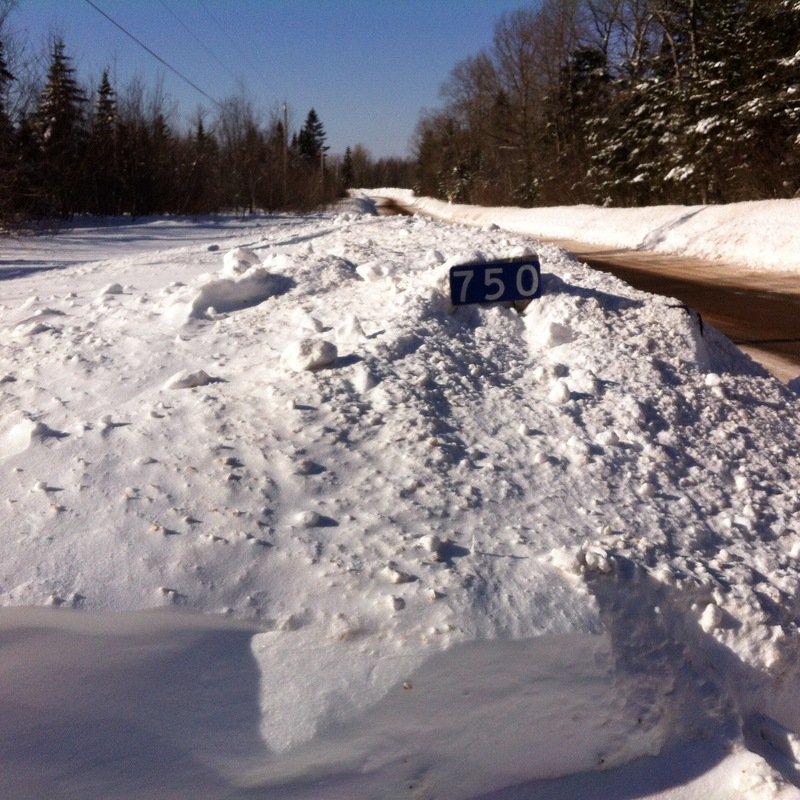 Many though were only short distances, with the exception of Portage E, which was 2.3 kilometres! Our group started off with a portage to the first lake, Big Dam Lake. 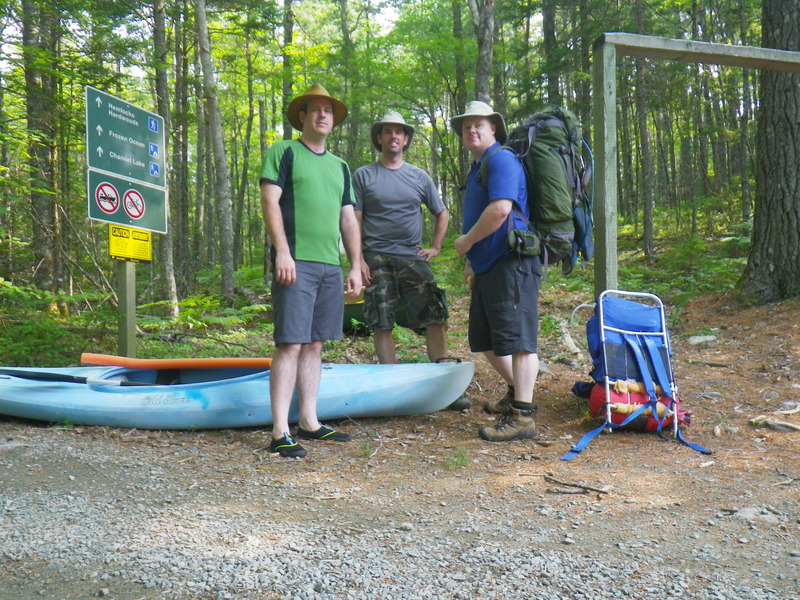 One thing to note was that the portage trails were well trodden and groomed throughout our trip. Portaging the canoe was something we traded off between all of us. The canoe was heavier, but easier to carry. 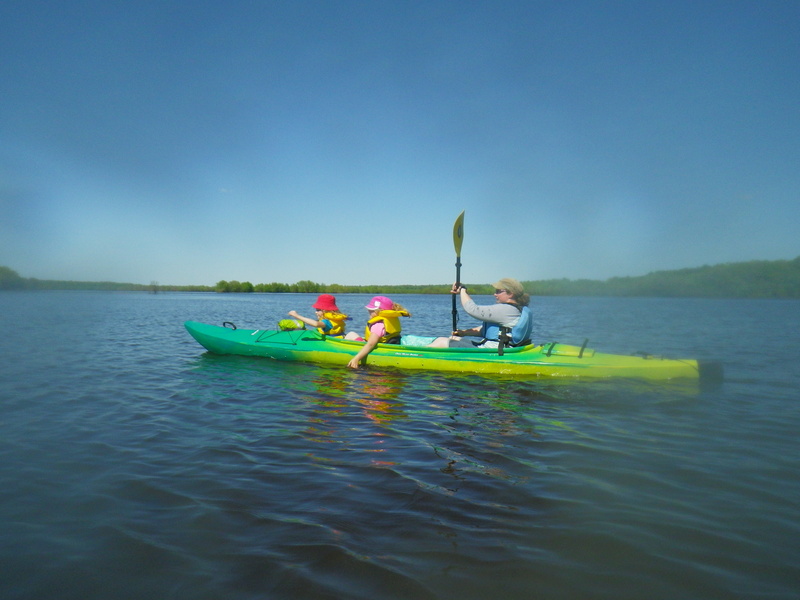 The kayak was lighter, but required carrying on your shoulder – which became a pain after a while. The weather and water for our trip was exceptional. Clear skies and flat water made for some awesome paddling. The photo below was us travelling on Big Dam Lake. Each trail is well outfitted with rest stops. 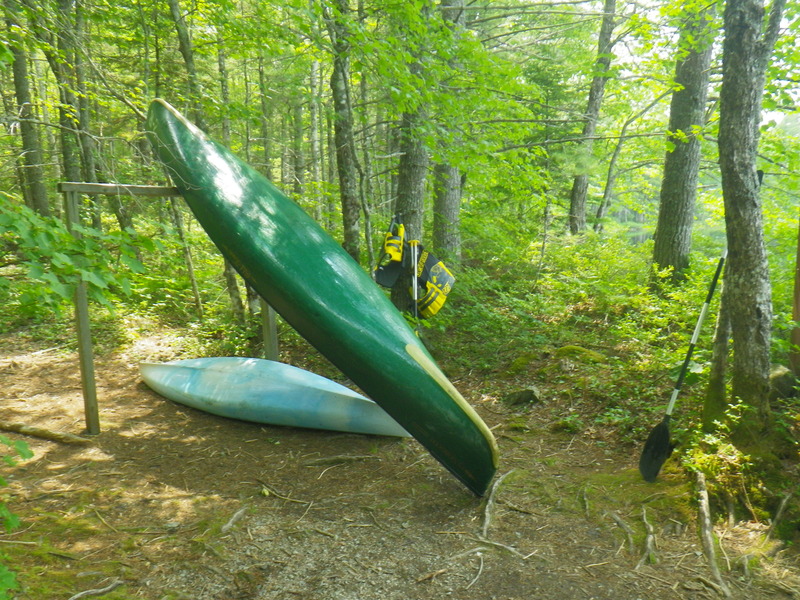 This one depicts the type of rest stop for canoe carrying. The frame is made so you don't have to heft your canoe too often after resting. 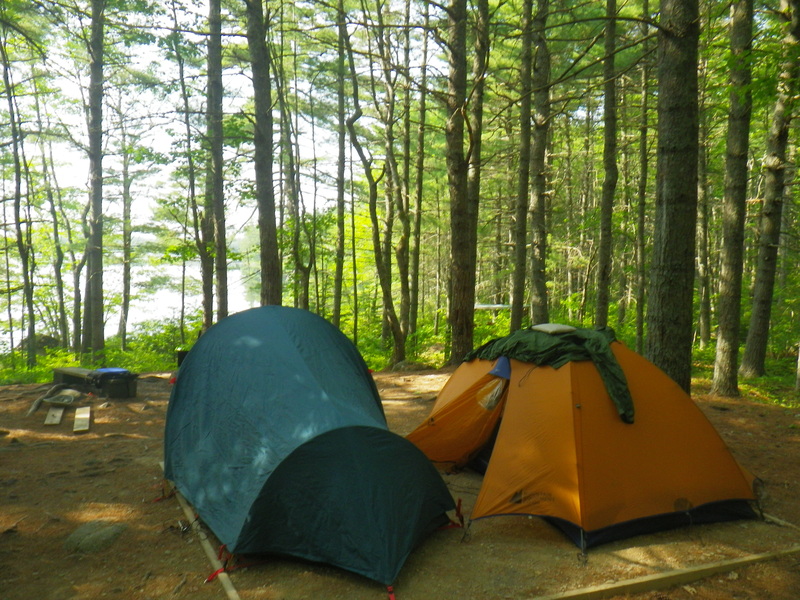 The campsites were well set up with tent pad areas and all the firewood you could burn (if you so chose to do so). This campsite was on Channel Lake. I will never forget the sound of the frogs that night. Imagine the sound of thousands of frogs croaking and echoing throughout the night — as loud as any highway or factory. Amazing, yet I was glad I had my earplugs. 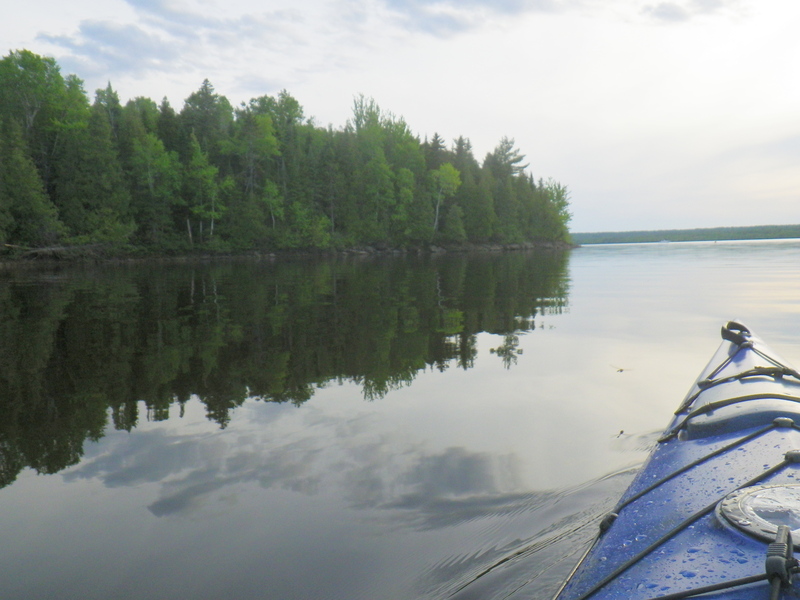 Knowing we had a long day ahead of us, we left early in the morning on the Little River toward Kejimijuik Lake. 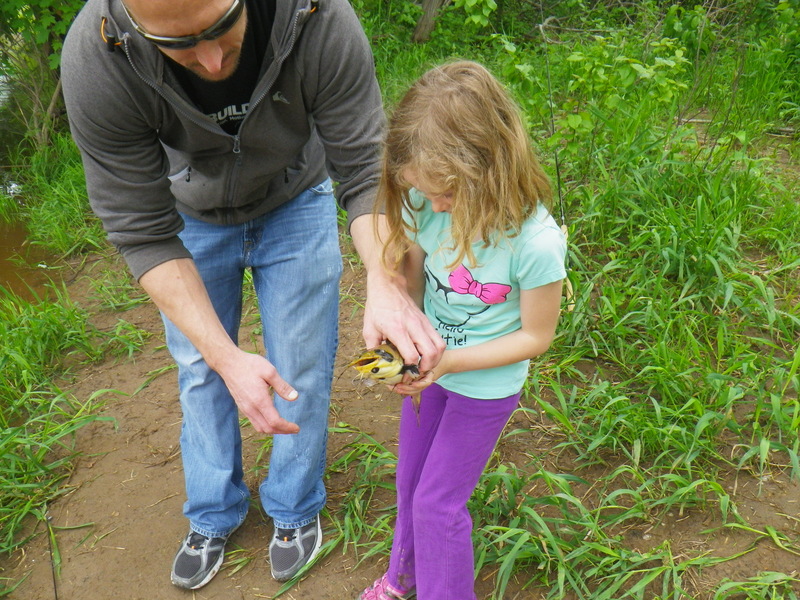 We also learned that there were new skills we needed to master, such as locating and avoiding rocks. 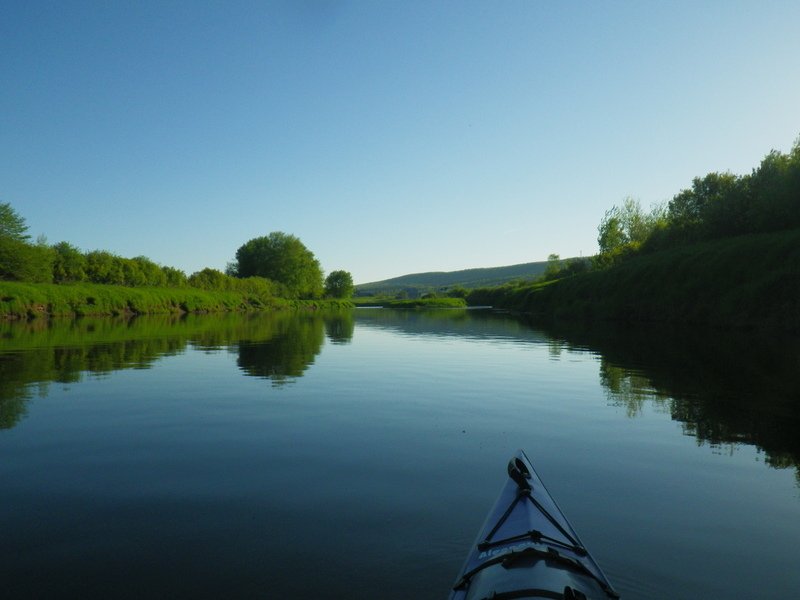 Little River was full of rocks, but a slow paddle was just as nice in the morning calm water. 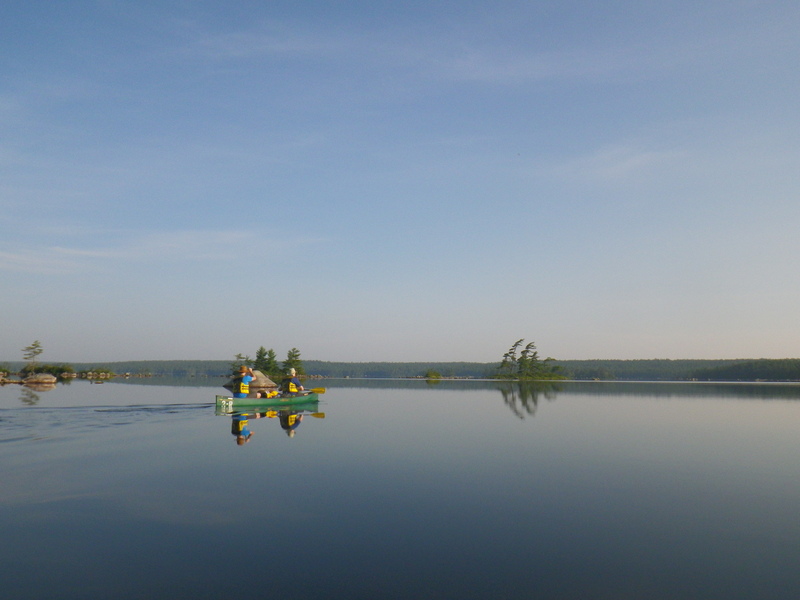 One of the more memorable paddles was our first travel across Keji Lake. A quiet morning with more calm water awaited our long crossing. I couldn't help but be awestruck by the serenity of the morning with the dim light from the clouded skies and the reflections off of the lake. For all of our portages, we opted for a single carry, necessitating for us to carry our packs and the boats in one trip. This was tiring, but doable and also made for us to make quick work of the walking portions. After a long day, we made it to Mason's Cabin off Peskawa Lake (see above). The area around Mason's Cabin was an incredible spot. Surrounded by high pine trees, Mason's cabin was a really fun spot to visit. 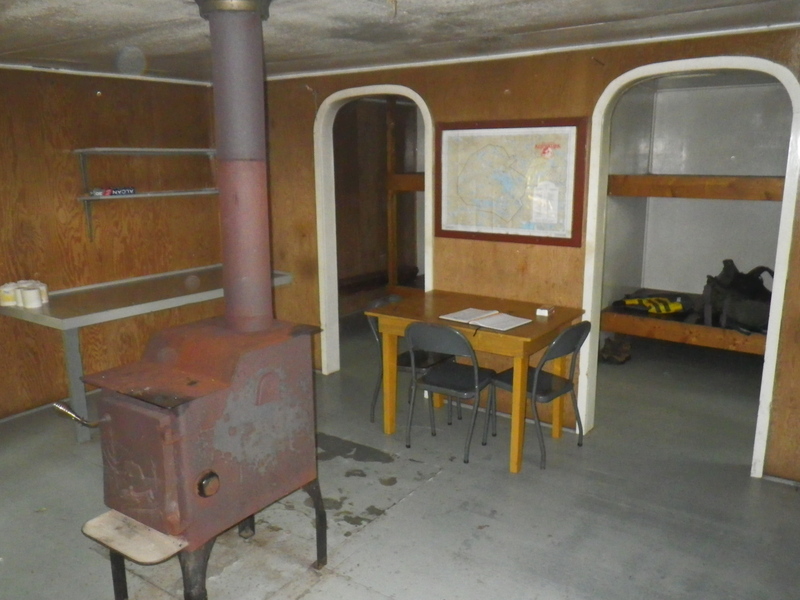 The cabin is completely outfitted with stove, bunk beds, fire wood, outhouse, picnic table and large firepit area. 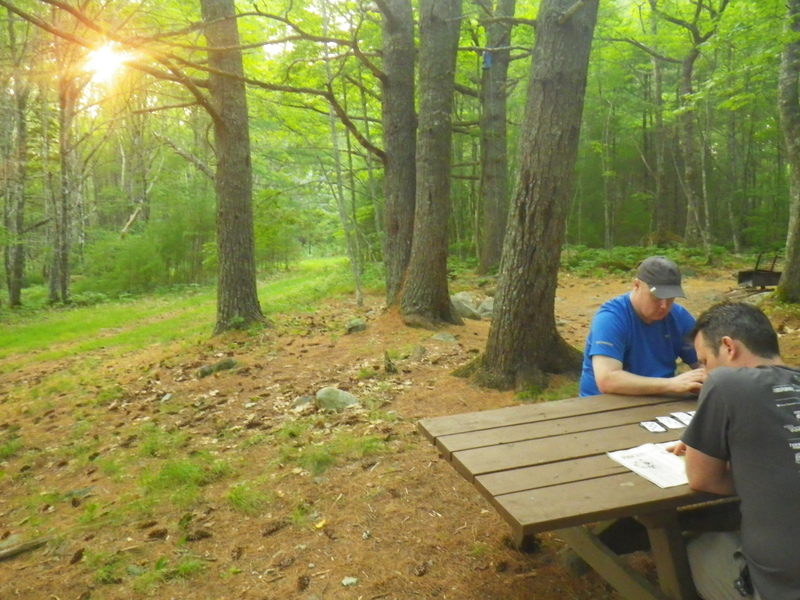 We spent the evening swimming, reading books, perusing the cabin's logbook and relaxing in the warm evening air. I couldn't believe that we were in Keji, but the bugs only came near dusk. We were clearly lucky on this trip. Another clear sky morning and amazingly calm water greeted us for our departure from Mason's cabin. We made way for our long haul back to Keji Lake. Our shoulders were definitely feeling the portages now, after three days into our trip. I managed to find a sweet spot between my pack and the yoke, which certainly helped spread out the weight. I've since seen a few other ways of carrying using straps and such, which may make it easier to carry the canoe. Our arrival at Campsite 18 was welcomed by a few snakes and a wonderful pebble beach. Matt and I lounged in the water for an hour before really doing anything, which also included baking myself on the hot rocks. Matt made a clever montage of our time in Keji. See his video below, as posted on Youtube. 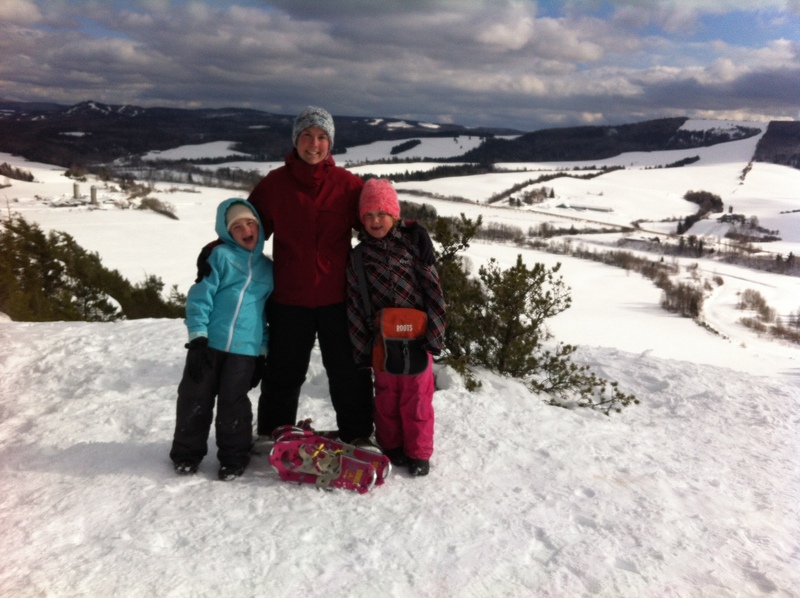 I thought I would share a few photos of the girls on their March Break, which Sheena ensured was full of fun activities. Nearly every day, they went skating and swimming at the Sussex Pool. 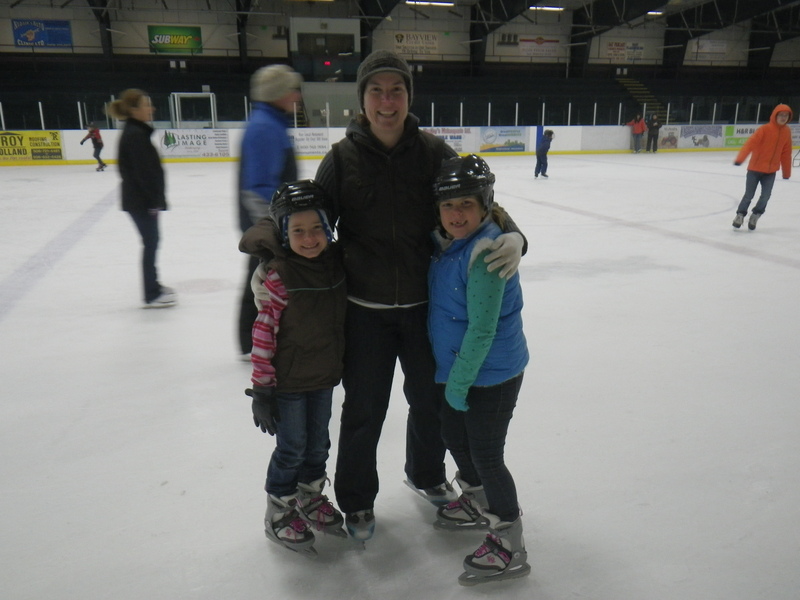 Both girls are becoming quite the skaters now. Abby is actually using both feet and concentrates very hard on her technique. Rebecca spends most time flying around the ice and has yet to learn how to stop. 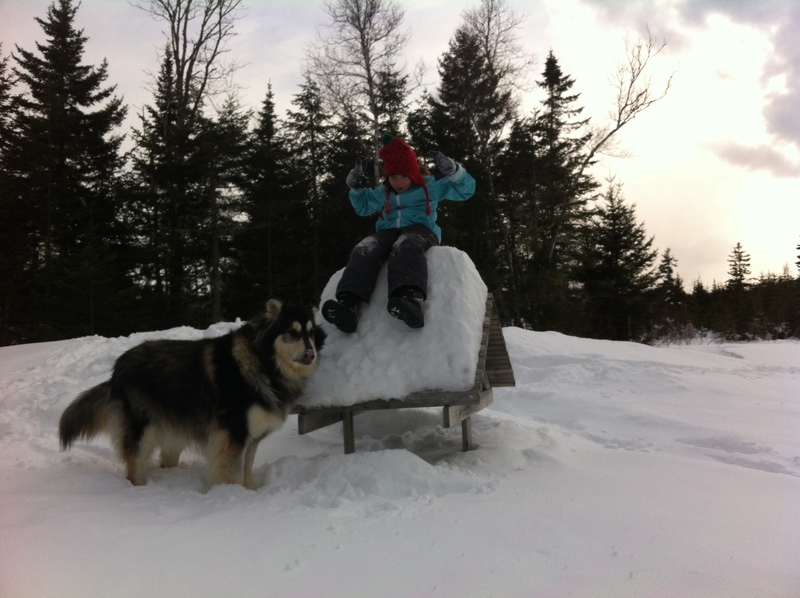 Sheena also took them on a group snowshoe/hike in Sussex at the Bluff Trail. 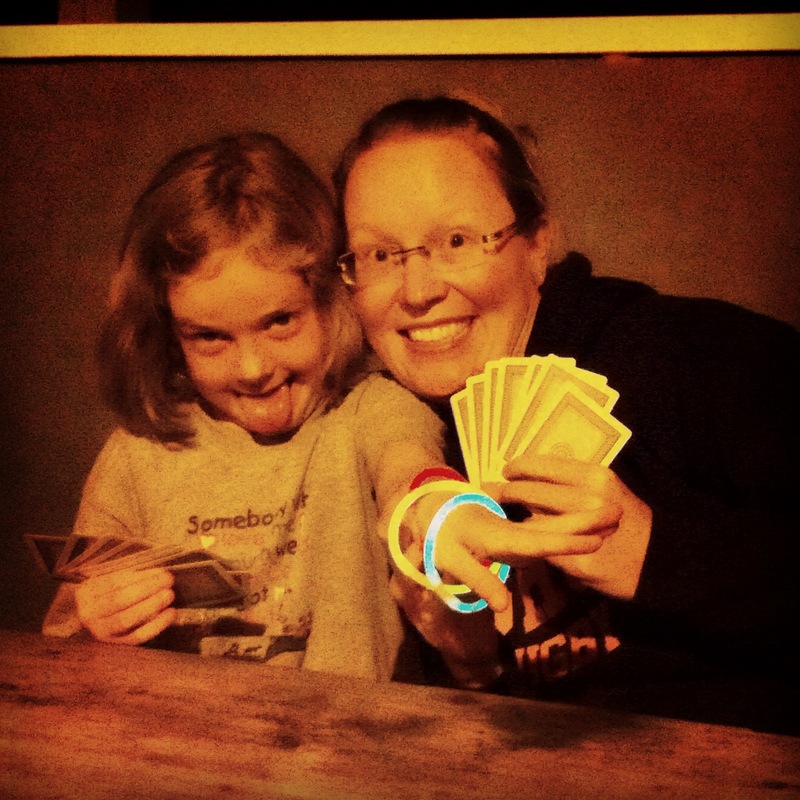 The photo below is Abby and her dear friend Kim. Abby was demonstrating her caring self by taking care of her friend. Sheena said they walked most of the trail hugging each other! Here is the group shot from the look off at the turn around point. There were quite the lot of them! Sheena with the girls at the look off. Poley ski hill can be seen in the background. 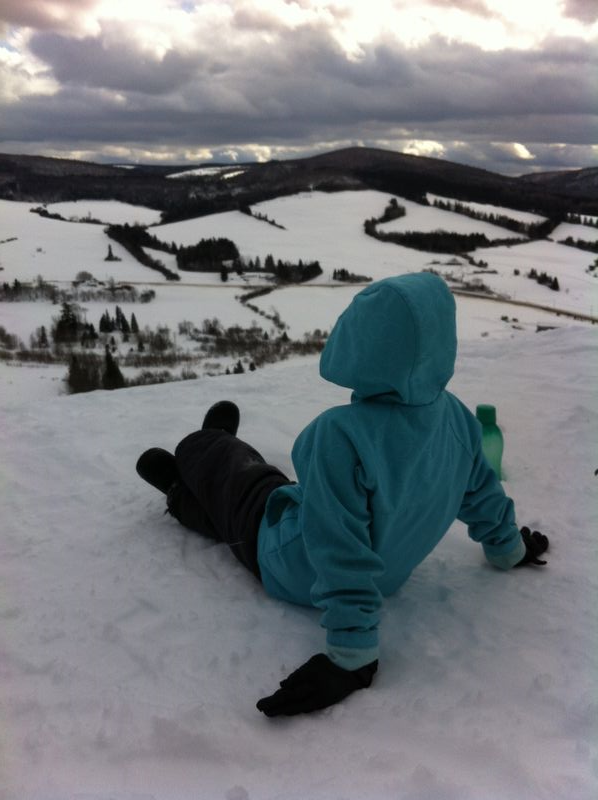 Rebecca enjoys a nice view from the look off. Our snow is piling high! This sign is about 5 feet in the air. We've been constantly shoveling it out the past month. Rebecca easily sitting on top of the well cover. There is a good 4 feet below her. The girls also started a little play spot in the woods beside the driveway. 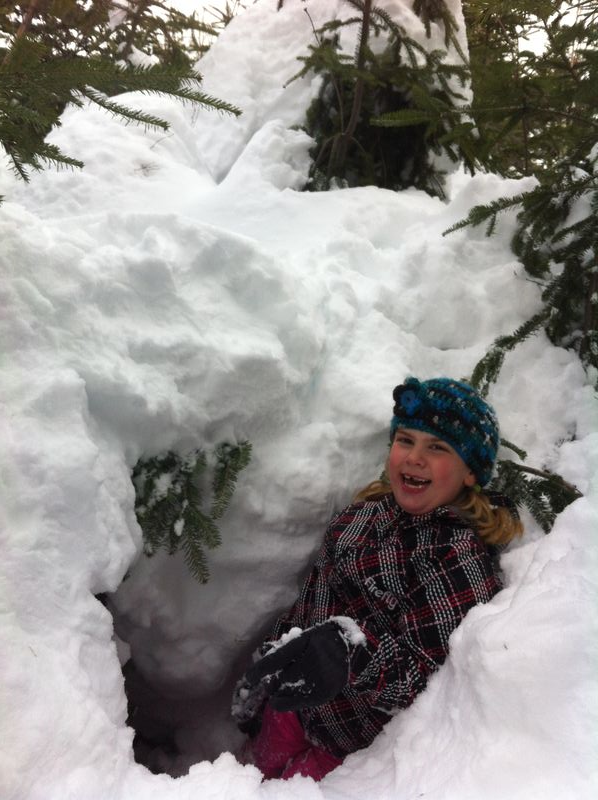 Here's Abby falling into a hole that Sheena made when trying to walk on top of the snow. What have I been doing during March break? Well working of course, but also for the past 4 weeks I've been taking a kayaking safety course at the pool in Saint John. Here's a few photos of me trying to practice the movements for rolling a kayak. 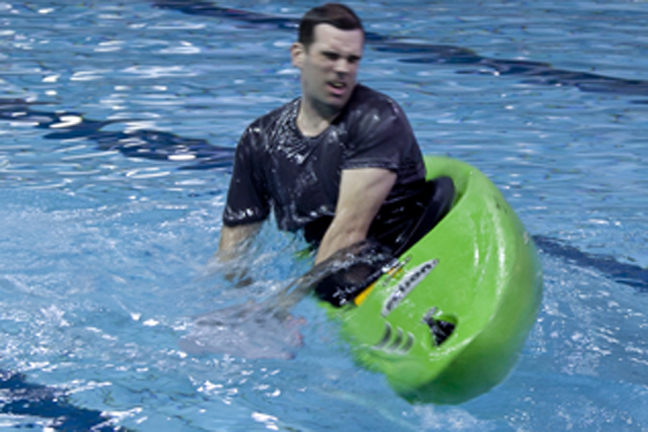 We use river runner/white water kayaks for practice, with nice neoprene skirts to prevent the water from coming in. Notice my technique is a bit wrong with my head up instead of down! Thanks to Bob Vlug of Eastern Outdoors for the photos. I thought I would share some photos of the busy summer we had after returning from Calgary. 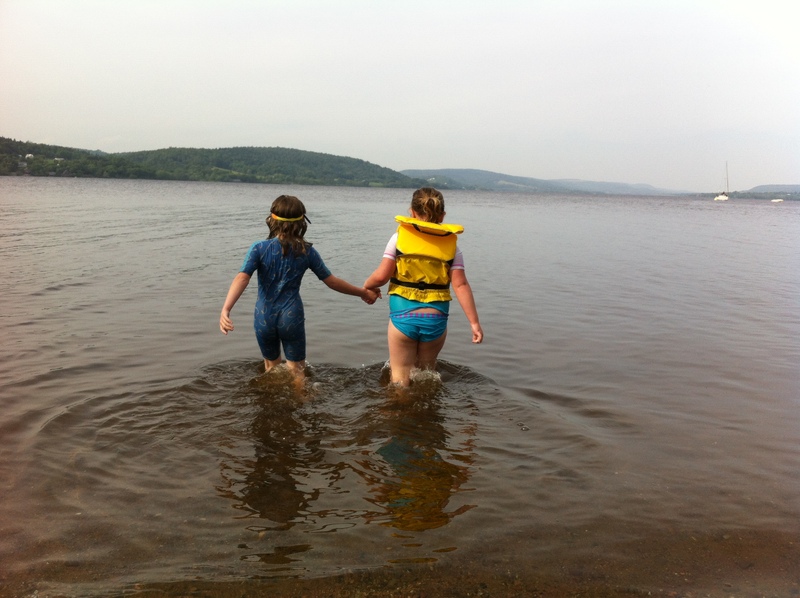 Our first real summer water experiences were on the Belleisle Bay near the ferry landing. There is a small public beach there — perfect for an evening swim on a hot day. We had a couple of great afternoons down at the bay before Sheena took the kids to Cape Breton around the second week of July. 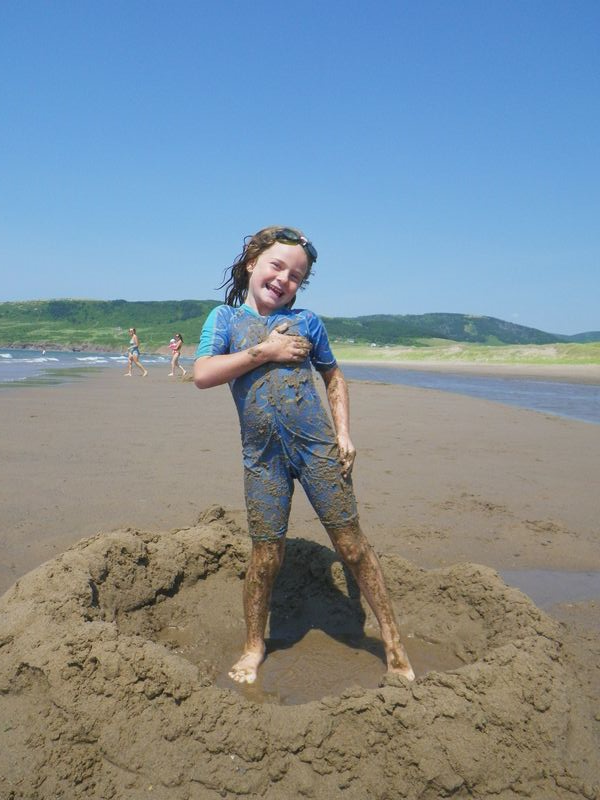 After arrving in Cape Breton they continued the beach-cation experiences, which would continue for a month! The daily schedule usually was: morning of prepping for the evening (supper), lunch and a visit with Grampa at the store, then to the beach for the afternoon and ice cream from the nearby ice cream shop. (4 hours at the beach earns 1 ice cream!). The kids certainly made the most of the nice weather we had. I was able to join them on the third week of July. 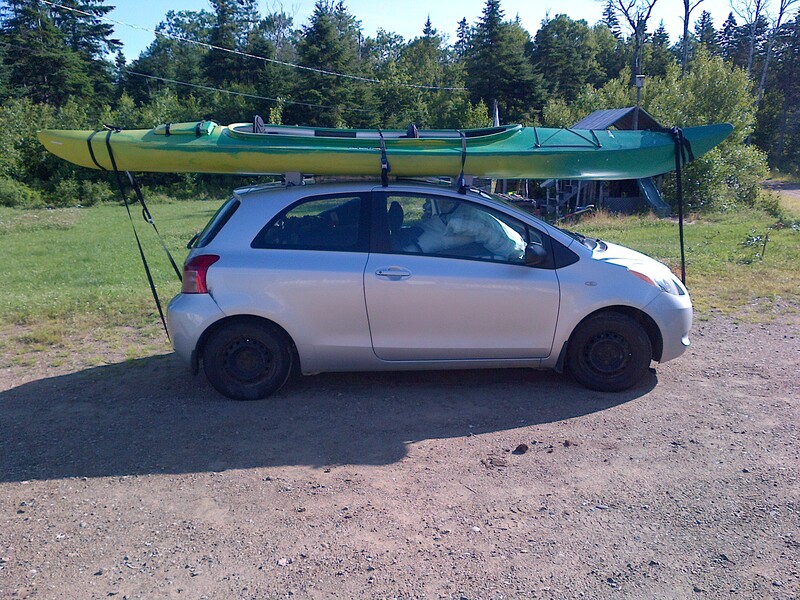 I brought the double kayak and Willow in the Yaris for the six hour trip to Cape Breton — which was an experience in itself! 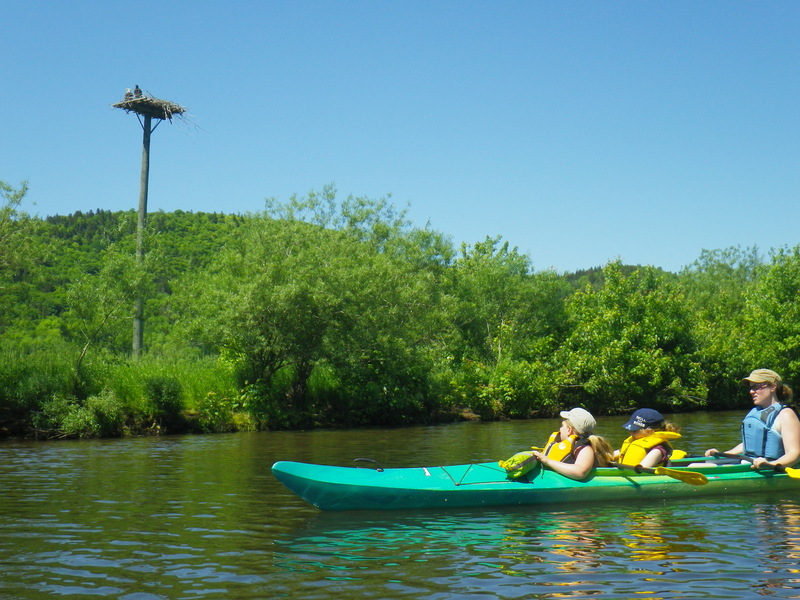 A few days later, I took the girls on a kayak around Mabou toward the Harbour. 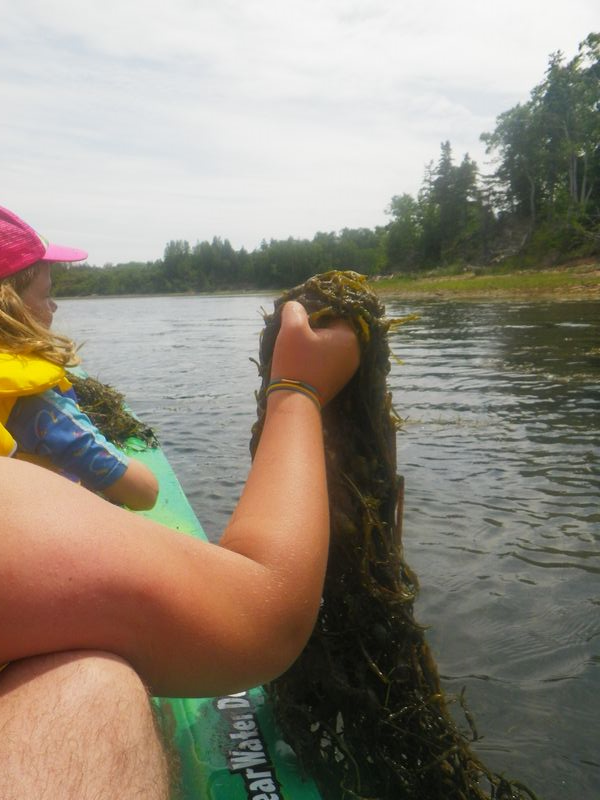 They had fun pulling seaweed from the water and collecting it in the boat. We stopped for lunch on a little peninsula in the harbour. The girls walked around and explored the beach before we had our lunch. 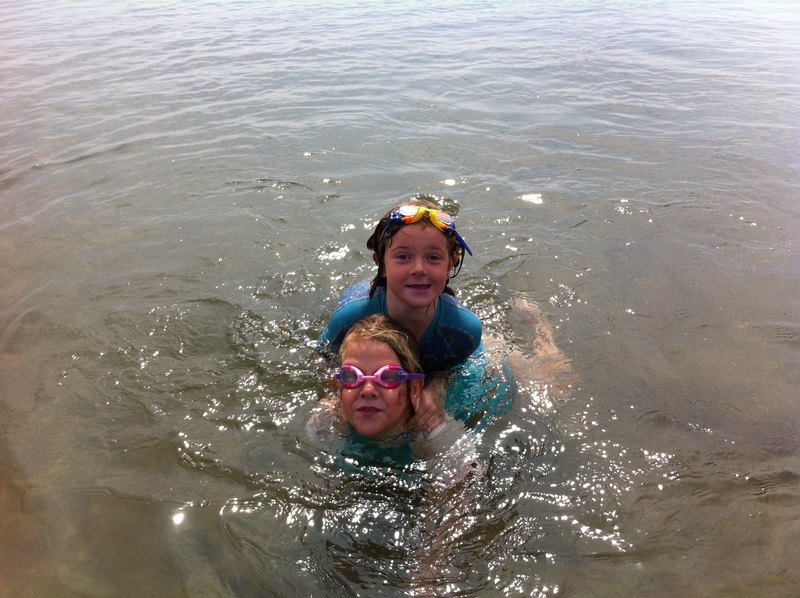 We headed to the Port Hood beach on another day with our cousins. It was a ball watching all the (third) cousins playing together and all the first cousins resting and chatting on the beach. 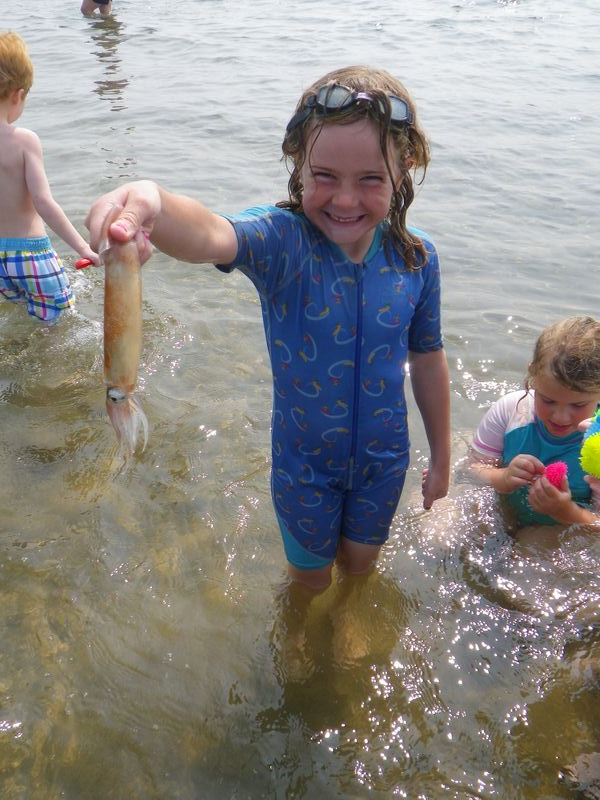 Rebecca ended up picking up a squid during one afternoon. This photo is just after the squid tried to get away and emptied all its ink at the kids! Rebecca really will pick up anything. 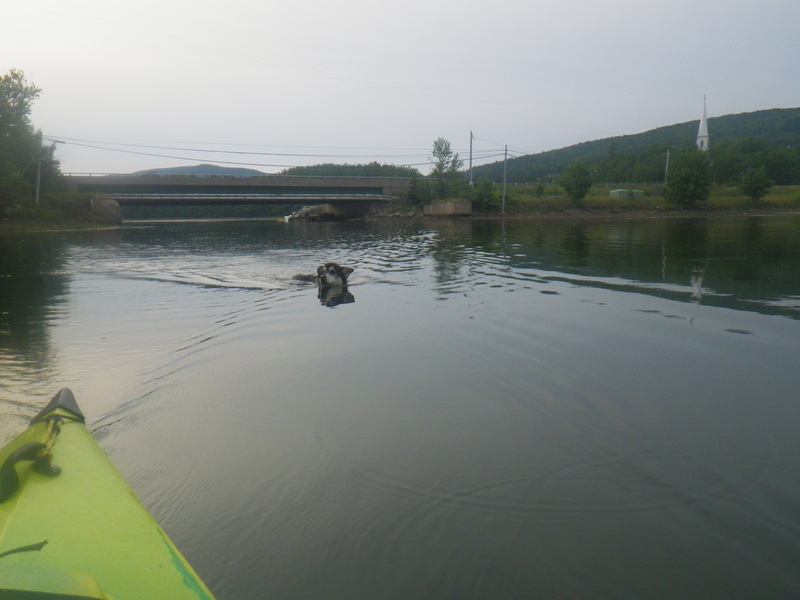 On an evening with Willow, I headed up the Southwest Mabou River from the wharf. Willow prefers to swim most times. It makes for a bit slower going, but she really enjoys the water. The return trip made for some perfect lighting. It was right around this point (after about an hour and a half) that Willow decided to come aboard. It was at that point how I learned that paddling a double kayak with a roaming dog in the back is a challenge not to swamp the boat! 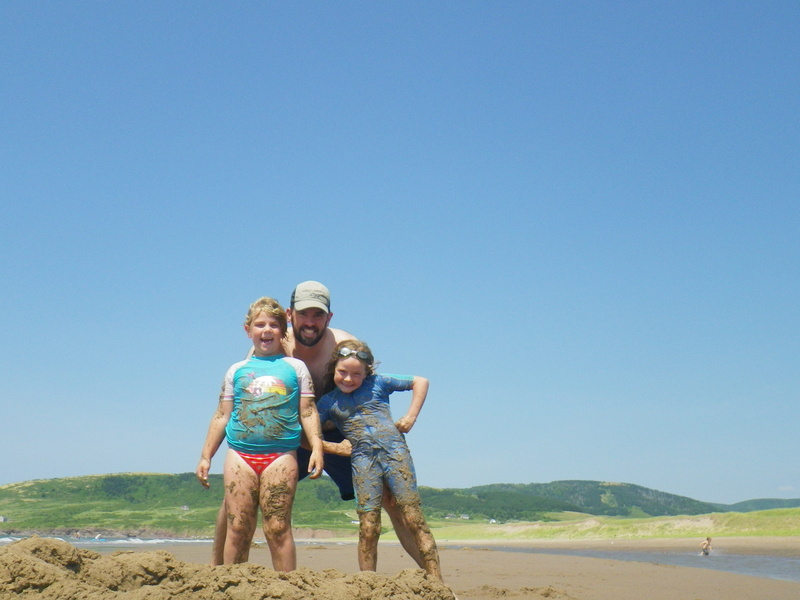 Here we are on another beach trip, this time to Mabou Beach on a scorcher of a day. It was beautiful. The kids spent their time in the sand (as you can see) and made their castles, moats and then washed off in the waves. Rebecca had to have her mud bath first before doing any swimming. It really was neat just to see the kids play on their own. After one of our beach days, I decided to try the kids out with an evening in the tent in Mom and Dad's backyard. It was 'an experience' to say the least. Rebecca left for the house around 9pm, but Abigail stayed most of the night! Being their first tent-out, it was a good experiment. In our mornings before heading to the beach, we also went to visit Nana or 'Great Nana' to the kids. At 93, Nana is doing well and continues to crotcheting her afghan blankets – making for conversation during the visits. 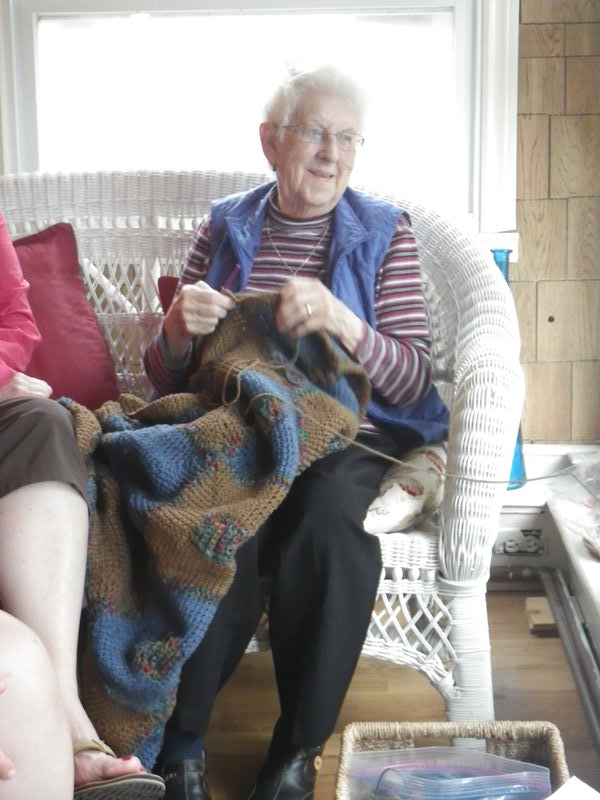 Here she is with her 129th blanket, just after watching my Mom try a few sections. She is usually able to make one every 2-3 weeks, sometimes quicker and loves thinking and talking about the people that she is making them for. 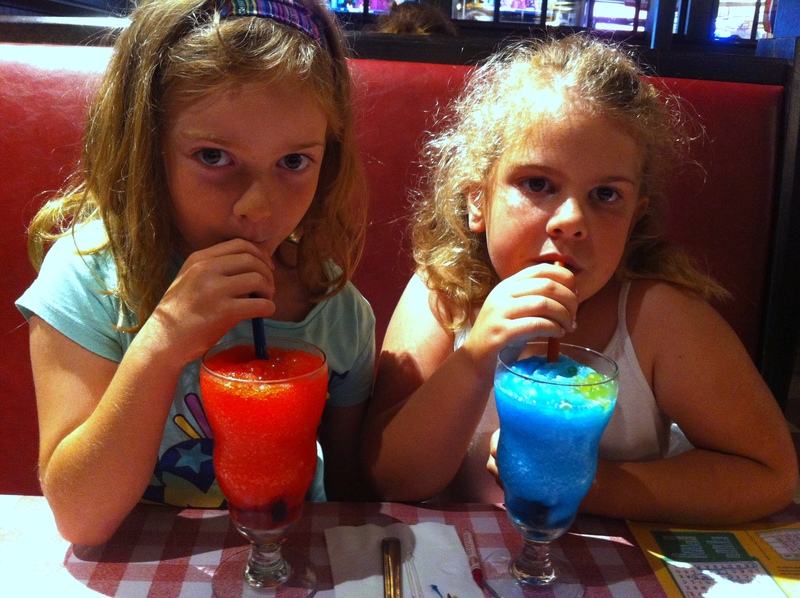 The girls made a day trip to Sydney for shopping. Here they are at East Side Marios getting fancy drinks. They really look old in this picture! More beach time for the beach bums, this time at Port Hood with more of the cousins. Abby usually carried Rebecca around on her. 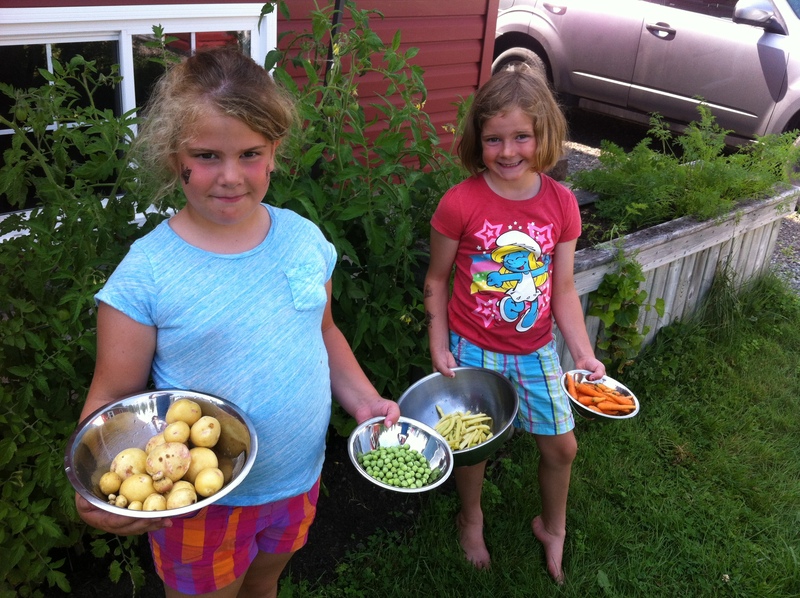 Stopping off on the way back from Cape Breton, the girls picked vegies at Sheena's parent's place. I doubt these lasted very long in the bowls! Sheena's cousin Karen made it back to Belleisle for a couple of days near the end of August. Sheena and her went for a paddle on the Bay one evening. They are double kayak superstars, ressurecting the boat from it's previous status as 'the divorce boat'. 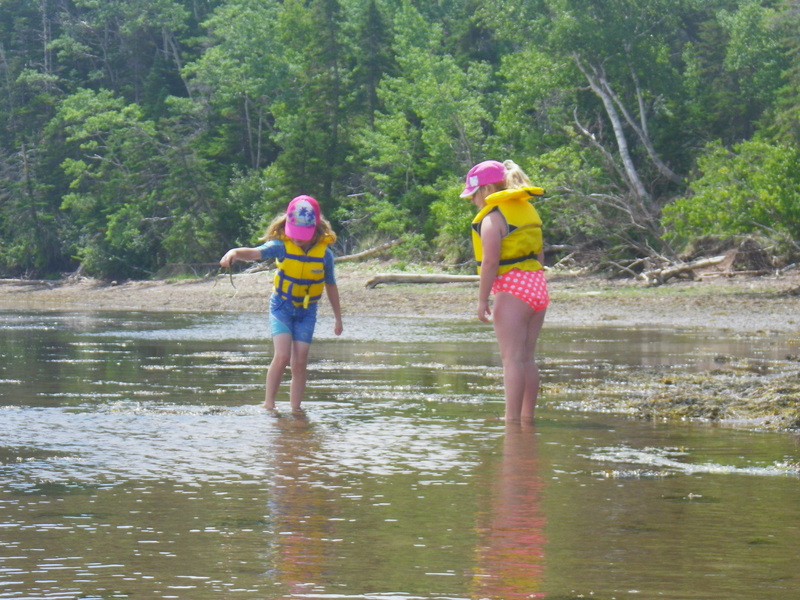 During that same week, Sheena and Karen took the kids to Fundy National Park for another camping trip. 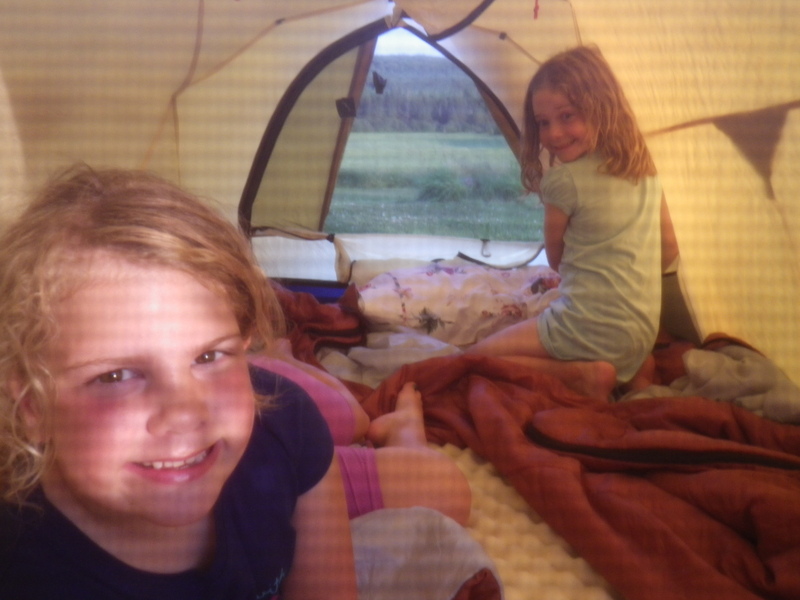 The girls got a real camping experience with playgrounds, campsites, picnic tables and of course, a great big tent to sleep in. 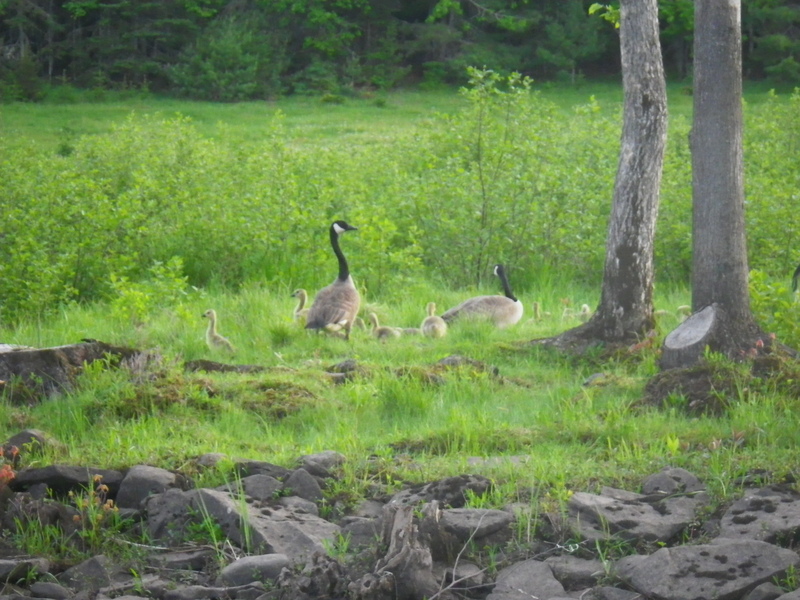 They came back to tell me all about the friends they made in the campground. Sheena said it was very neat to hear them running around all day and night until well after dark, chasing each other and other kids with flashlights, only to crash hard for a good night's sleep. 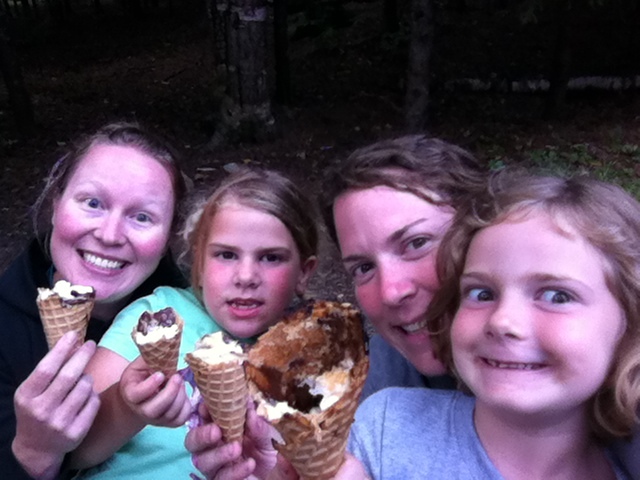 The absolute hit of the trip was Karen's invention of icecream waffle cones, banana slices, chocolate and marshmallows. To make the treat, wrap it in tinfoil and toss it on some hot fire coals. Makes for a delicious treat. 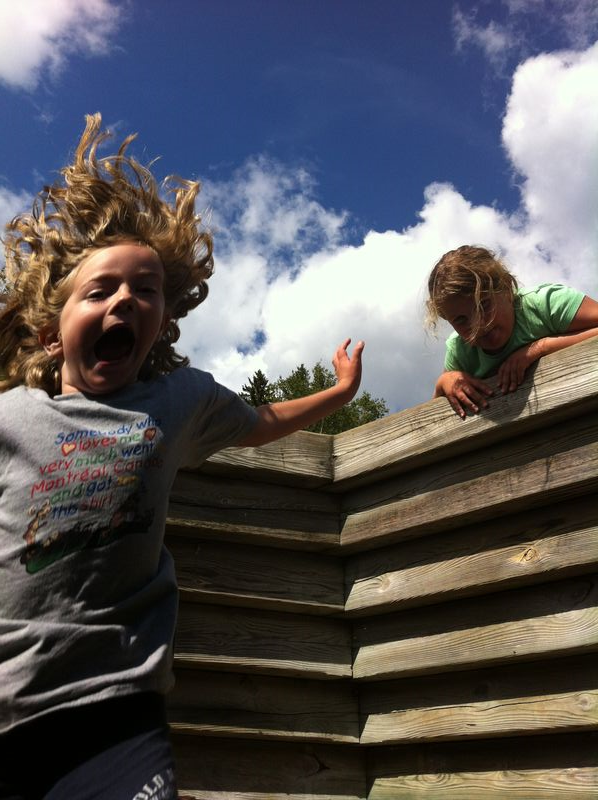 One of Rebecca's classic jumping photos from their time at Fundy Park. Lots of fun to be had. Earlier in June, we had a visit from Auntie Wee (Laurena) and Uncle Nick (now called Uncle 'Fish'). 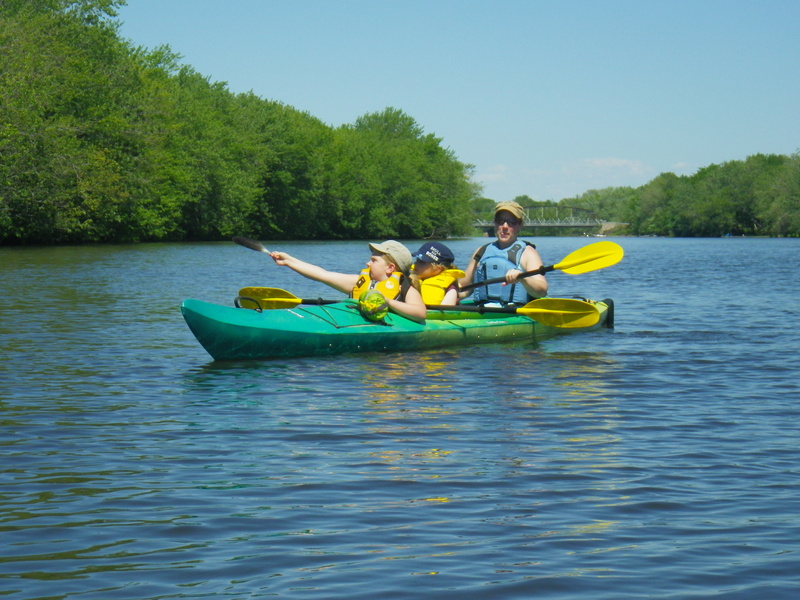 On a weekend with great weather, we went fishing on the Kenebecasis River by Bloomfield and the following day from the wharf at Hatfield Point. Uncle Fish showed a few of his well honed tricks, which both girls took to quite quickly! Rebecca caught a bunch of different fish, including a weird looking catfish! Rebecca didn't seem to mind holding the fish and wanted to let all the fish back into the river herself. 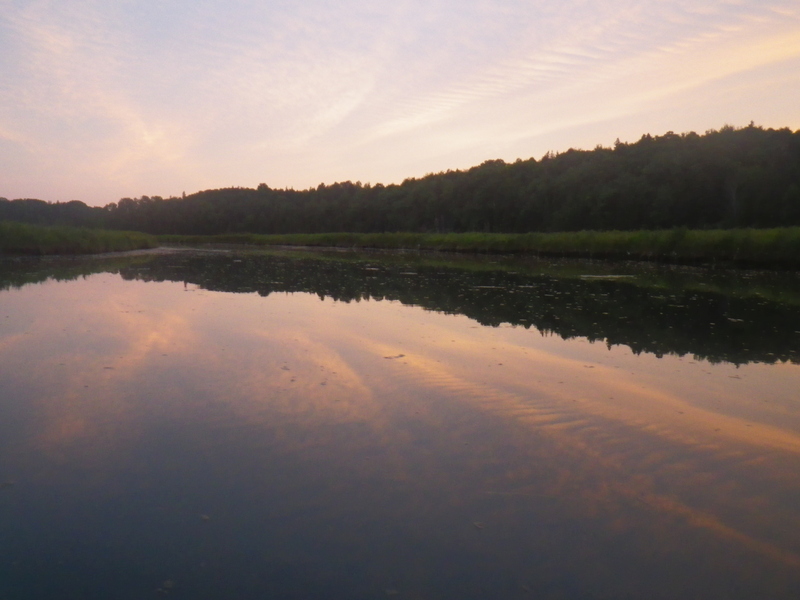 Later that week, I had an evening paddle on the Kenebecasis River from Norton toward Bloomfield. The weather was perfect and the bugs weren't quite biting just yet. 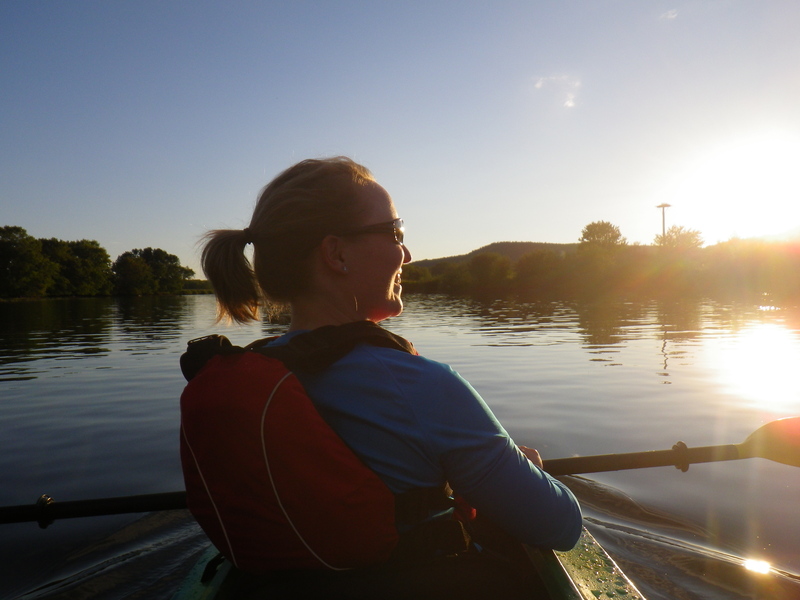 I learned a few things about paddling that night, including when to portage to make things easier. It really is incredible all the beautiful places that are nearby where we live, that we drive past on the highway — not even knowing they're where they are. Later in the month on a hot Sunday afternoon, Sheena and I went out with the girls to Washamedoak Lake near Codys. 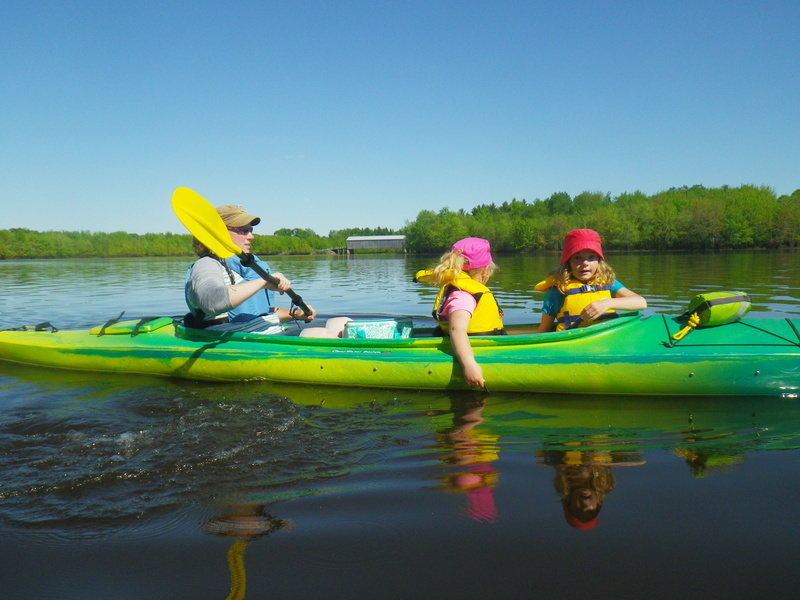 It was the girls first trip in a double kayak and they were excited to seek out new places. The girls were interested in the water flowing past them — so much so that we had to make a rule, 'fingers only in the water!' 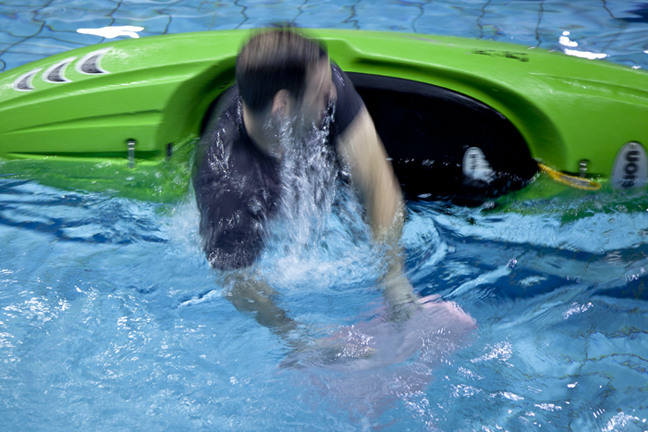 We saw how easy it is to slow down a kayak with drag from 4 hands. We headed east on the lake toward the Caanan River and covered bridge. While turning back around an island, we saw an impressive beaver dam. We were surprised at how the maple trees continue to grow while still submerged in water most of the year. Looking both ways with the covered bridge in the background. 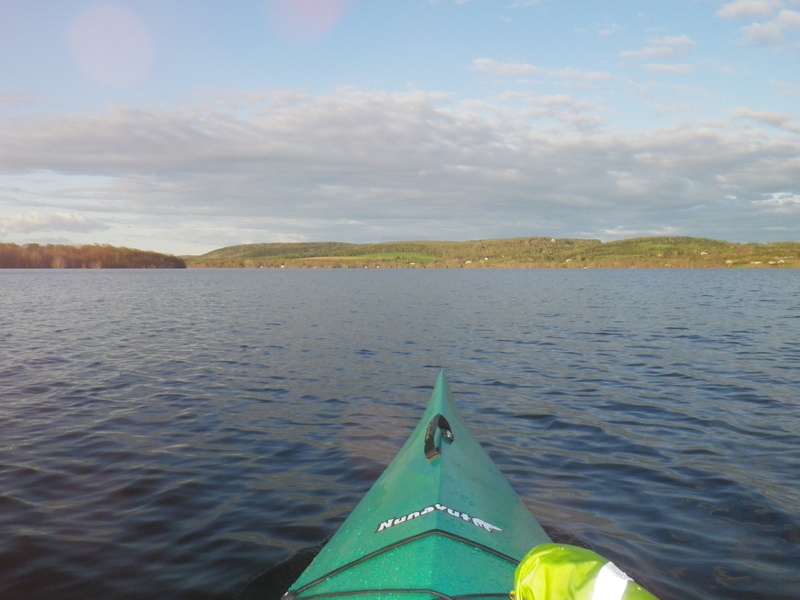 On yet another evening paddle, putting in near Salmon Creek Road, I went west on Washamedoak Lake toward Cambridge Narrows. After a few minutes, I came across a lower field that borders the lake. The field is somewhat isolated from the rest of the farm and has taller grass near the water. At the bottom of the field were about 20 pairs of geese nesting in the field and were herding their little ones through the tall grass. In going past the area on the water, I saw them herding the younglings one direction away from my boat and when returning the same way, they herded them up the field in the opposite direction! 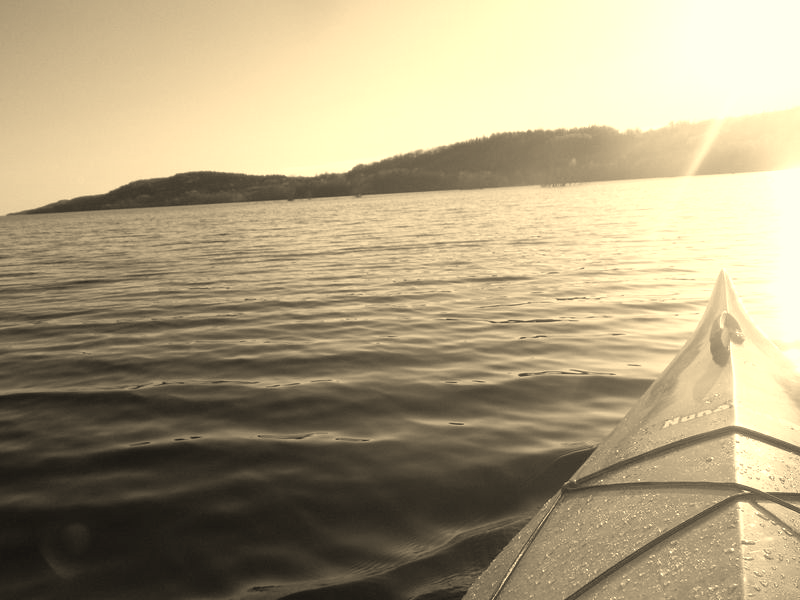 Its pretty hard getting a steady photo on the kayak as well. 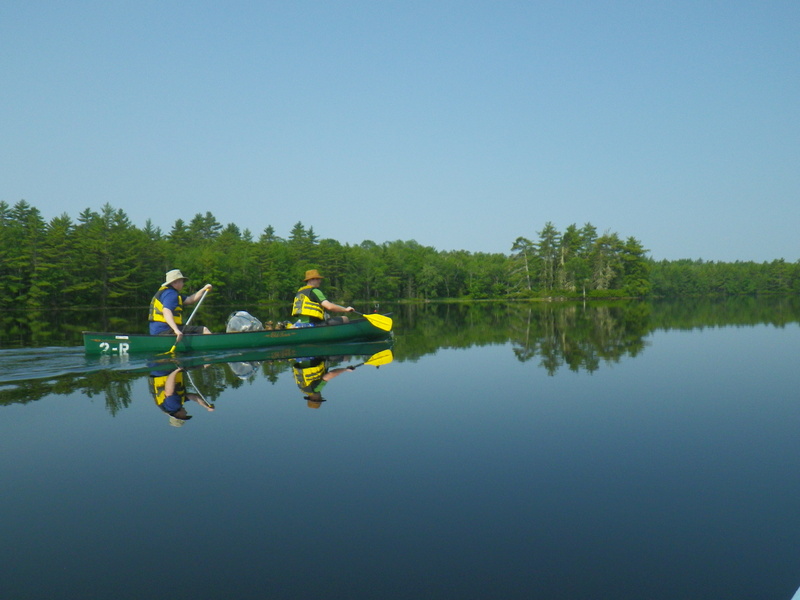 The Washamedoak is a beautiful lake to paddle. It is a long lake, with rocky and hilly shorelines, stretching to the east toward the Caanan River and the west toward the Saint John River. I've been on a few times already and have only seen one other kayak. …new adventures! 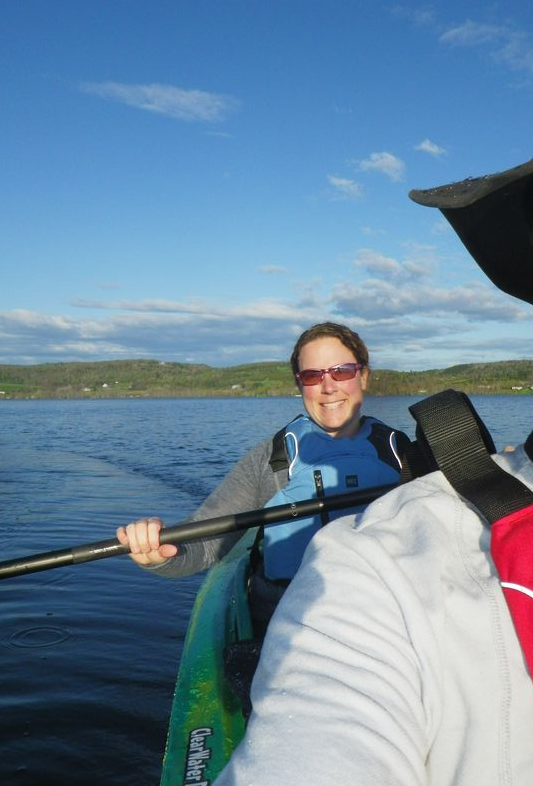 Sheena and I headed out for an evening paddle on Belleisle Bay this past week. It was our first time paddling a double kayak. Teamwork is the operative word when paddling a tandem! We had a few beautiful evenings this week. With warm weather coming, we sure will appreciate being on the water.